This comic was inspired by my recent trip home to Australia. I met up with a dear friend from high school whose joy for living has definitely helped shaped Bunson. Who we are is very much shaped by the company we keep and she was an inspiration to me. 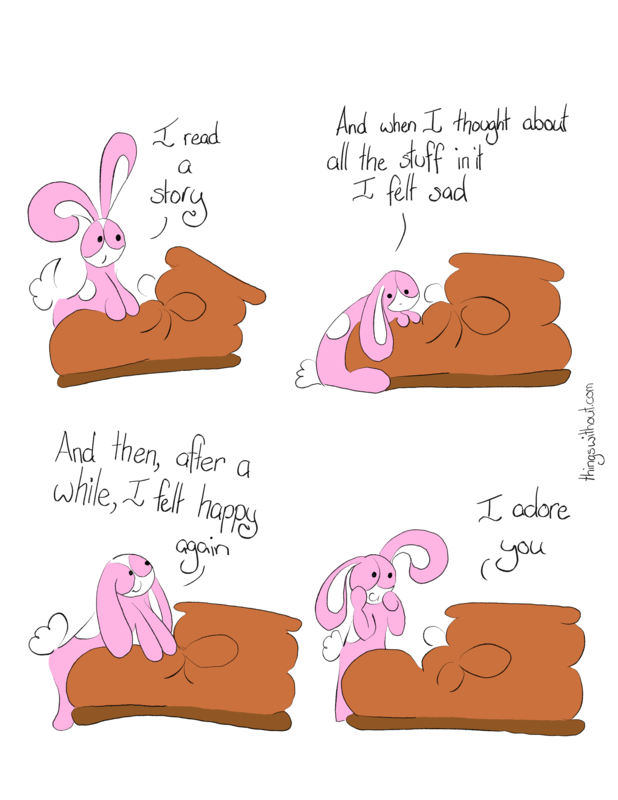 This comic is pretty much a conversation we had once at school… I’m not sure if I actually said “I adore you,” but I definitely felt it. My gloomy Boot self was in awe. I also continue to experiment with this fancy new pen I have (an Adonit Pixel Pressure Sensitive iPad Stylus). It’s not as fancy and responsive as an apple pen and definitely has some issues, but it doesn’t require me to buy a brand new iPad. And when I thought about all the stuff in it I felt sad. And then, after a while, I felt happy again.